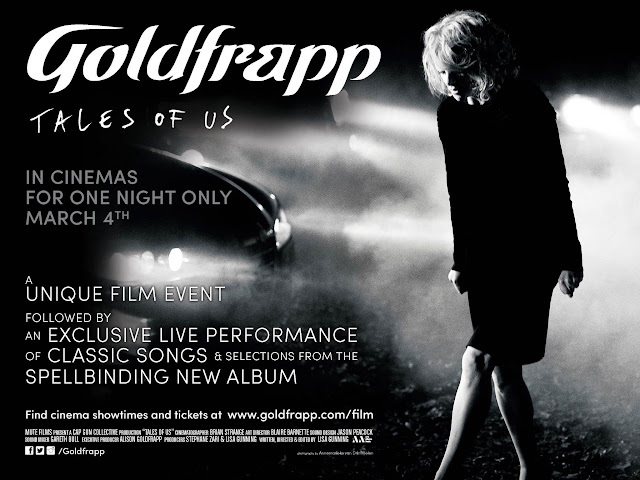 Goldfrapp have announced details of a very special Tales Of Us cinema event – a worldwide screening of the stunning film Tales Of Us followed immediately by an exclusive dramatic live performance transmitted into cinemas from the magnificent surroundings of the legendary Air Studios in London. This must-see state-of-the-art experience will be broadcast by Arts Alliance Media across the UK, Europe, North America, Australia and New Zealand on the evening of 4 March 2014. To register your interest and see more information including locations of screenings and other exciting reveals in the coming weeks visit: www.goldfrapp.com/film and the official Facebook and Twitter #TalesOfUsFilm channels. Inspired by Goldfrapp’s latest album, Tales Of Us, the striking film is a 30-minute journey through five of the individual stories featured on the album. Stranger, Laurel, Jo, Drew and Annabel interconnect subtly, sharing themes of love, loss, madness and identity, taking the viewer on a unique musical journey. Five stories, each one based on a song from the Goldfrapp album 'Tales Of Us'. With only two stories having been seen previously this is an incredible exclusive opportunity to see the film Tales of Us as it was intended, as a complete journey and on the cinematic big screen, available in select locations for one night only. Cinema audiences will see the Tales Of Us film transition beautifully into a live 50-minute dramatic theatrical performance by Goldfrapp including classic songs and selections from the spellbinding new album. The Tales Of Us film was co-created by Alison Goldfrapp and director & writer Lisa Gunning (Nowhere Boy, Seven Psychopaths, Salmon Fishing in the Yemen). The marquee creative team behind the live cinematic event includes Executive Producer, Catherine Ugwu, MBE (Executive Producer of the London 2012 Olympic and Paralympic Opening and Closing Ceremonies); critically acclaimed set designer Shona Heath (Dior, Valentino, Prada) who also created the iconic owl that graced Goldfrapp’s Seventh Tree album artwork; and lighting designer Rob Sinclair (Vampire Weekend, Pet Shop Boys).